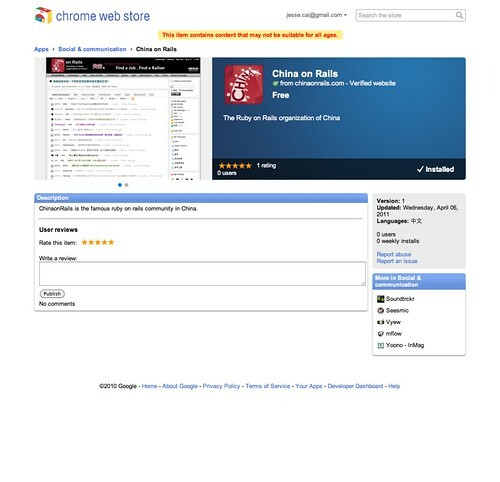 from group "互联网创业 (Internet Startup Bootcamp)"
China on Rails - Chrome Web Store, originally uploaded by caiwangqin. I just created a Google Chrome app for ChinaonRails, you can install it to you Chrome now, please fell free to have a try. Yes, this is not a rumor, after discussed with my partner, i resigned Bindo Labs yesterday, which i co-founded since May 2010, an HK-registered Start-up Company focused in International e-Commercial Market. I really hated it's not being public by 11 months development. Why i left, i'm getting super tired and we lack of communication beside New York and Shenzhen, i'm not happy to work with people do not respect each others. Actually Bindo.com is being online private beta for several months, and i think it will be public soon, best wishes! In the past few years, i lead development team make ideas happen, and we had an operation team to promote it. Now i like small ideas much more, which can be implemented in 3 months, I don't know what I'm going to do next, I'll make my own small ideas come true, take some time off stay with my family before I start job hunting.